At Ishika Fashion, our aim is to make shopping convenient for our customers, which is why we offer a range of payment options. 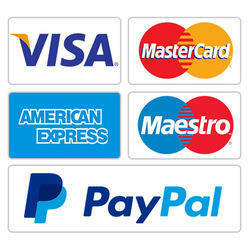 We accept MasterCard, VISA, Discover, JCB, American Express, Diners Club cards and Maestro cards. EMI details and T&C’s will be available on the payment gateway website. We support net banking with SBI, ICICI, HDFC, Citibank, Kotak, Axis Bank and Others. We support payments through Mobikwik & Paytm wallet. We have taken several steps to ensure that payments made on Ishika Fashion are safe and secure. At no point will anyone from Ishika Fashion ask you to share your Credit Card, Bank Account or Ishika My Account details via email or call. We request that you do not share these details with anyone under any circumstances.